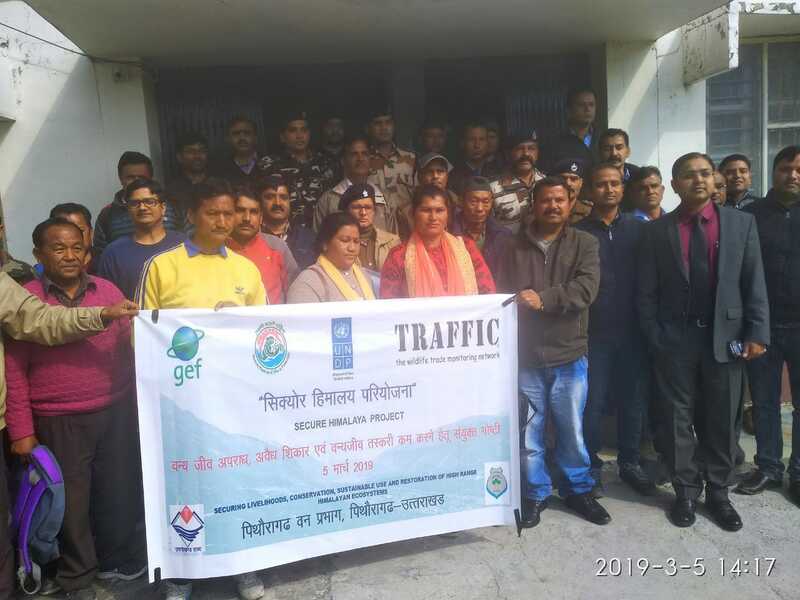 Pithoragarh, Uttarakhand: Last month, under SECURE Himalaya, a new initiative to document and combat illegal wildlife trade in the Himalayas region was launched through a stakeholder’s consultative meeting organised by TRAFFIC in collaboration with Uttarakhand Forest Department. The project aims to ensure conservation of biodiversity, land and forest resources, while enhancing the lives and livelihoods of local communities in the high-altitude Himalayas (Jammu & Kashmir, Himachal Pradesh, Sikkim and Uttarakhand). 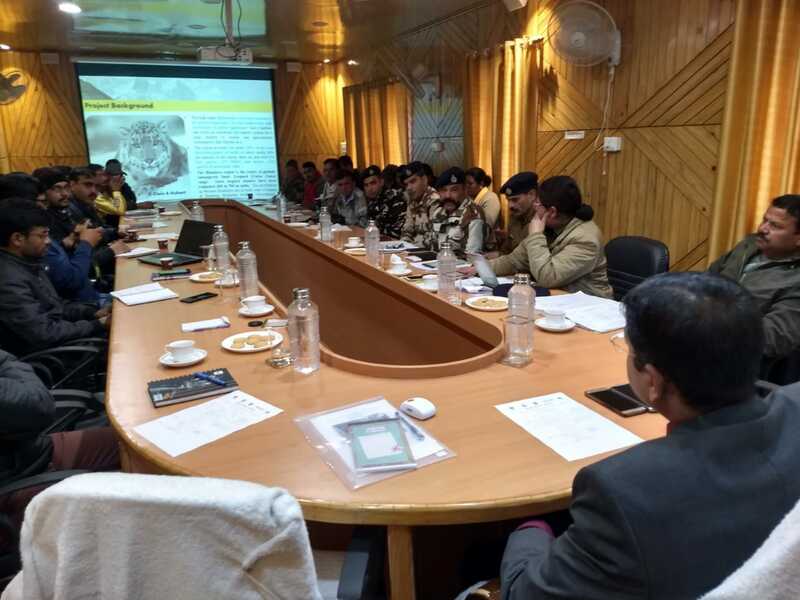 Last month’s meeting set out to engage local communities, identify relevant stakeholders, assess levels of wildlife trade, and enhance collaboration among various enforcement agencies working in the Himalayan region of Uttarakhand. Those attending included members of local communities (village heads/Pradhans) and 31 senior officials from the State Forest Department, Indo-Tibetan Border Police (ITBP), Sashastra Seema Bal (SSB) and local Police Departments. Uttarakhand is a remote region, with rich biodiversity and long international borders with Tibet Autonomous Region (TAR) and Nepal. The Pithoragarh district within Uttarakhand lies at the juncture of India, Nepal and TAR and there have been numerous cases of poaching and smuggling of wildlife contraband including bear bile, musk pods and leopard skins through the porous borders. Yarsa Gumba Ophiocordyceps sinensis, commonly known as Caterpillar Fungus, is also illegally traded trans boundary in the region, together with various other threatened plant species. Dr Vinay Bhargav, Divisional Forest Officer, Pithoragarh Forest Division chaired the meeting and spoke about the purpose of SECURE Himalaya and the essential involvement of various stakeholders to address the threat to biodiversity posed by illegal and/or unsustainable wildlife trade. Mr Devray Dugtal, Head (Pradhan) of Dugtu Village in Pithoragarh district, spoke about his feeling of living in such a biologically rich area and how an initiative like SECURE Himalaya can help community members explore new livelihood options that are sustainable, both for their future and for conserving the biodiversity in the region. Mr Kishan Baunal, Head of Baun Village spoke about the economic importance of medicinal plant trade and suggested simplifying the rules and regulations for collection and trade of plants such as Sea Buckthorn Elaeagnus rhamnoides, whose pulp, seeds and oils are traded across the country. He said that such a move would encourage local communities to engage on sustainability issues. Meeting outlined plans to engage local communities, providing support for legal and sustainable medicinal plant trade and exploring alternative livelihood options. Capacity building for various enforcement agencies would help them deal with wildlife crime and illegal wildlife trade and other authorities could be brought in, including the revenue department and military. This meeting was organised under the SECURE Himalaya project led by the Government of India through the Ministry of Environment, Forest and Climate Change, in partnership with the United Nations Development Programme (UNDP-India) and State Forest Departments, with financial support from the Global Environment Facility (GEF). TRAFFIC is a partnering agency in SECURE Himalaya.